Samsung took a totally different approach with its new Galaxy S6 phones. Rather than cramming tons of new features into the phones, the company improved on a few core elements including design, build quality, and the fingerprint sensor. Samsung may not have added as many new features to its latest Galaxy phones as it has with previous devices, but the S6 and S6 Edge can still do quite a few things the iPhone can't. 1. You can use the Galaxy S6 and S6 Edge to make payments at any store with a credit-card reader using Samsung Pay. Apple Pay, which is compatible with the iPhone 6 and 6 Plus, works only at terminals with near-field communication enabled. A customer making a purchase with a MasterCard using Apple Pay on the iPhone 6. 2. You can also charge Samsung's new phone wirelessly with a charging pad instead of plugging it in. Apple's iPhones need to be plugged in to charge. 3. The Galaxy S6 and Galaxy S6 Edge can be charged super quickly; Samsung says 10 minutes of charging will get you four hours of use. The iPhone doesn't have fast-charging technology built in. 4. With the Galaxy S6 Edge, you can assign a specific color to any contact. Your phone will light up as that color when the contact calls. No such feature exists on the iPhone. 5. You can launch the camera on the Galaxy S6 or S6 Edge by double-tapping the home button. On the iPhone, you need to either launch the camera app or press the camera icon on the lock screen. 6. The camera on the Galaxy S6 also tracks a subject as it moves so it doesn't lose focus. The iPhone doesn't do this, though Apple has added some new features to iOS 8 that make it easier to edit photos quickly. 7. Both new Samsung phones come with a Smart Manager app that lets you clean up your phone with the press of a button. Some third-party apps, like Checker, claim to do this for the iPhone, but it is unclear how well they actually work. 8. Most Samsung Galaxy devices, including the Galaxy S6 and S6 Edge, let you run more than one app at once on the home screen (Galaxy S4 shown below). The iPhone lets you open only one app on the screen at a time. 9. 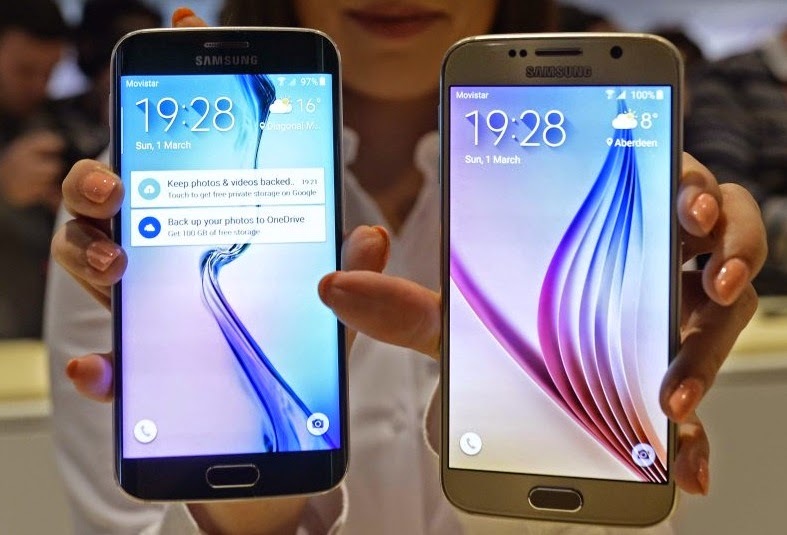 The Galaxy S6 and S6 Edge can also measure your heart rate. Apple has added some health-related features to the iPhone over the past few years, like the step counter in the iPhone 5s. None of Apple's iPhones have a heart-rate monitor, however. 10. With the Galaxy S6 Edge, you can still see the time even when the rest of the screen is turned off. There's no way to do this on the iPhone.